From Bob McCulloch to Scott Walker, Whom Does the University Serve? This post is part of The Nation’s biweekly student movement dispatch. As part of the StudentNation blog, each dispatch hosts first-person updates on youth organizing. For recent dispatches, check out January 16 and February 11. Contact studentmovement@thenation.com with tips. Edited by James Cersonsky (@cersonsky). On Monday, February 9, undergraduate and graduate students at the University of Minnesota acting under the banner, Whose Diversity?, staged a sit-in at President Eric Kaler’s office to press the administration to take immediate action to improve conditions for students of color and other marginalized communities at the predominantly white institution. Sixteen students informed Kaler that they would remain in his office until eight demands were met, while more than 100 people rallied outside for eight hours. Our demands include the removal of descriptions of race and complexion from university crime alerts, the hiring of more faculty of color, the installation of one gender neutral restroom in every campus building and the creation of a new program to recruit students from local, working class neighborhoods of color. 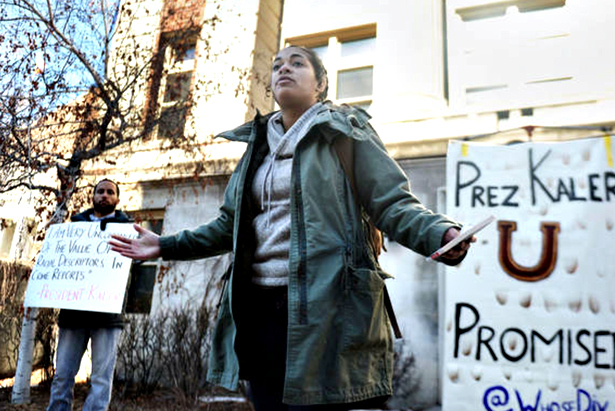 The president remained unwilling to commit to these changes, instead calling on the police to make arrests for “trespassing.” In total, thirteen were arrested—the #UMN13—and spent the night in jail. We remain committed to forging a university that values the lives of all its students. On February 20, Bob McCulloch, the prosecutor who handled Darren Wilson’s case, is scheduled to speak at the Saint Louis University School of Law at a symposium titled, “The Thin Blue Line: Policing Post-Ferguson.” On February 9, students involved in the Ferguson community spoke at an SLU community town hall meeting to ask the administration to uphold the school’s Jesuit mission by rescinding McCulloch’s invitation. We then led the room if four and a half minutes of silence to show respect for Mike Brown and the clients we serve in Ferguson. We oppose McCulloch’s appearance because of his numerous ethical violations and show of disregard for the community he serves. Students, alumni and other members of the community respectfully continue to show opposition by sending letters to the administration. This spring, the Virginia Student Power Network has been fighting to prevent the Virginia General Assembly from passing legislation which would prohibit survivors of campus sexual assault from seeking confidential help from their universities. Proposed legislation would require administrators and staff to call the police when a survivor comes forward seeking help in the wake of a sexual assault—even if involving the police is against their wishes. Students from across the state have attended hearings in Richmond and met with legislators to testify that these bills would limit survivors’ options and agency, with a chilling effect on reporting. Multiple survivors bravely testified that, if this law had been in place, they would never have come forward to their universities about their assaults—which is crucial for receiving academic accommodations, counseling, housing adjustments and no-contact orders. Following this pressure, both the House and Senate dropped the “mandatory reporting” requirement from their bills. Currently, both versions still require police involvement if the sexual assault constitutes an ongoing threat to the health or safety of the campus community (which is already required, in some cases, by federal regulation). In the final two weeks of the legislation session, students, survivors and advocates will continue to push for changes to ensure that any bills passed do not damage survivors' ability to seek the support they need and the justice they deserve. On January 28, the Arkansas Board of Education held an open forum to decide the fate of the Little Rock School District. After four hours of community testimony, mostly in opposition to the measure, the board decided to take over the school district immediately. All school board members were removed from office, and the superintendent was kept only on an interim basis. The night after the takeover was announced, students, teachers and community members held a candlelight vigil on the steps of the Arkansas capitol building, and, on February 5, seventy students marched on the Arkansas Department of Education. We have formed the Little Rock School District Student Association to further the fight against a state-run school district. The UMass Amherst Graduate Employee Organization has been engaged in contract negotiations for the more than 2,500-member bargaining unit since June. Following the last-minute cancellation of a negotiation set for Tuesday, February 10, members of the GEO Bargaining Committee, along with forty union members and undergraduate allies from the Student Labor Action Project, staged a march, sit-in and teach-in at the office of the Graduate School in Goodell Hall and demanded to bargain at the scheduled time. We planted ourselves in the hallway outside the office of the Graduate Dean and the university’s main labor-management representative for ninety minutes and conferred about bargaining progress. At a rescheduled negotiation on Friday, we signed five tentative agreements; we are now set to become the second student-worker union in the country with a contract guaranteeing all-gender bathroom access. On February 12, the University of Massachusetts issued a policy barring the admission of Iranian students from certain graduate programs in engineering and natural sciences. While the administration argued that the policy change was necessary to comply with federal law and US Department of Homeland Security policy, a US state department official suggested in The Boston Globe, “US law does not prohibit qualified Iranian nationals coming to the United States for education in science and engineering.” Iranian students and community members, as well as faculty, mobilized in response to the policy, using the hashtag #‎weareallumass and creating a Facebook page which accumulated over 2,500 “likes” during its first day. On February 18, the administration announced that it would reverse course; Iranian organizations on campus have welcomed this move, while calling for clarity on the revised policy and transparency and fairness in future admissions. In a historic vote on February 8, the University of California Student Association passed a resolution to divest from companies that profit off violations of Palestinian human rights in the Occupied West Bank and Gaza Strip. The 9-1-6 vote represented the coalescence of years of grassroots, intersectional and coalition-based Palestine solidarity organizing from students across the UC system through Students for Justice in Palestine chapters. The vote constitutes the largest win in the nation for the student divestment movement against the Israeli Occupation; the UC Student Association is the official voice of more than 240,000 students in one of the largest public school systems in the United States. Organizers gathered from across the state of California to speak in support of the resolution, which included over ninety endorsing organizations from a diverse identities and issues. The coalition of SJP chapters on the West Coast, SJP West, will now take the call to divest to the Board of Regents. On February 13, the Global Day of Action for fossil-fuel divestment, more than 200 students from ten Virginia universities marched together on the University of Mary Washington to demand that our institutions cut ties with the fossil-fuel industry. This action, the largest in UMW campus history, sent a message to the Board of Visitors that we will not be silenced—after more than a year of action, ranging from sit-ins to performance art pieces. Building off the energy from the march, students from Divest UMW will present a twenty-minute proposal to the board. The event also kicked off Virginia Power Shift, a 400-student convergence organized by the Virginia Student Environmental Coalition and the Virginia Student Power Network to build power for social, economic and climate justice in Virginia.